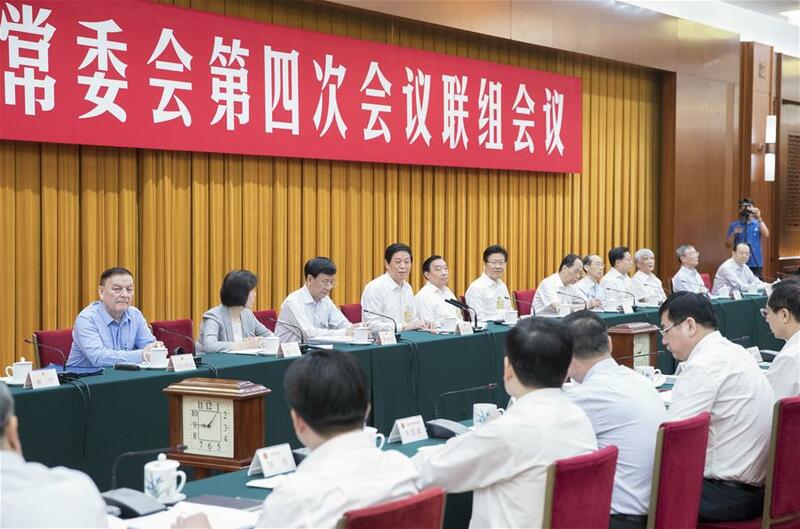 BEIJING, July 10 (Xinhua) -- China's top legislature on Tuesday held a joint inquiry into a report on the implementation of the Air Pollution Control Law. Li Zhanshu, chairman of the National People's Congress (NPC) Standing Committee, presided over the meeting and delivered a speech. The NPC Standing Committee sent four teams to eight provincial-level regions to check the implementation of the law from May to June. They also entrusted local legislatures in the other 23 provincial-level areas with inspections. During the inquiry, legislators asked questions about measures to prevent and control air pollution, control over emissions discharged by diesel-powered vehicles, industrial structure adjustment, and efforts to raise public awareness of the law, among others. State Councilor Wang Yong and officials from the Ministry of Transport, State Administration for Market Regulation, the Ministry of Industry and Information Technology, the Ministry of Ecology and Environment, National Development and Reform Commission and the Ministry of Justice, and those in charge of the Supreme People's Court and the Supreme People's Procuratorate answered the questions. Li called for implementation of laws and decisions on ecological and environmental protection to prevent and control pollution. The State Council and departments will uphold a new vision of development, implement the three-year action plan on winning the battle for blue skies, and enhance the work on air pollution control, said Wang.